The Spirit Pub Company has submitted plans that could see the Sandygate Hotel in Wath, Rotherham, given a new lease of life. Owned by Trust Inns, the hotel, restaurant and pub was given national prominence when its then operators, David and Dyan Elliott, featured in Channel 5's Hotel Inspector in 2010, looking to turn the business around. The hotel gained further notoriety when Elvis-loving Dave left suddenly in 2012 blaming "astronomical overheads and beer costs." Following a period under new operators, the eleven bedroom hotel was put up for sale. Now plans have been submitted for refurbishments that indicate that the site is being brought back into use. These include new access doors, new paved areas, a new smoking canopy and a kitchen extractor. The plans add that 35 new jobs, ten full time and 25 part time, could be created. Spirit, which is set to be acquired by rival Greene King in a £750m deal, operates 750 high quality pubs under a number of brands including Fayre & Square; Flaming Grill; Taylor Walker; and John Barras. 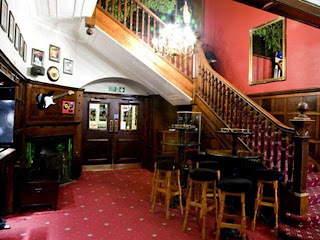 It also operates Good Night Inns, a group of hotels located next to its pub restaurants. This includes The Brentwood and Rockingham Arms in Rotherham. In its financial results for the 53 weeks to August 23 2014, the company saw earnings increase 7% to £159m and profits up 11% to £60m. It added that it was looking to grow through its existing portfolio and through acquisitions and saw a significant opportunity to roll out its successful brands. £75m was available to fund expansion. 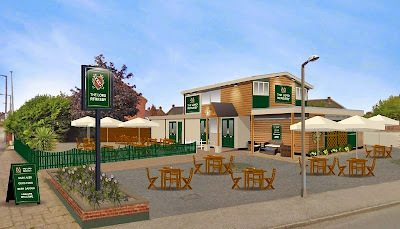 At Thrybergh, Star Pubs & Bars Ltd, the leased pub business of Heineken UK, has submitted plans to renovate the Reresby Arms with new entrances, full external redecoration with oak cladding and new signage. If approved, the renamed Lord Reresby (cgi above) could lead to a doubling of job numbers to 12 (four full time and eight part time) as it could accommodate 50/60 covers. The company, which invested £18m in its estate last year, said that the 60's building is subject to a proposed refurbishment "which will include but not limited to an overhaul of the overall image and bring a focus on a good food offering." The Master Brewer at Bramley is set for a new lease of life as offices for Wickersley firm, Aeon Financial Services. After acquiring the former Marston's property, the established firm of Chartered Financial Planners and Independent Financial Advisers (IFAs), has submitted plans to convert the pub into office accommodation. The plans state: "The new scheme will allow the company to consolidate its business in one location without moving to far from its current base. This will be achieved by forming new accommodation within the existing structure. The scheme will be privately funded and has been designed in a manner that allows public access by appointment with AEON Financial Services."